I have embarked on a difficult topic this time. Net neutrality is a subject of academic study with political and business implications. But I have decided to write about it as a layperson who reaps the benefits of a 'free' internet. and I guess this is where most of us are at. The context of the debate is the FCC Proposal for net neutrality that goes for vote tomorrow and eventually to the US Congress. While the laws that get passed will be applicable to the US, they will definitely set a precedent for other countries. 1) The proposed legislation will be applicable only to all forms of broadband access (wired and wireless broadband) and will not regulate the actual content of the internet itself (in any case, it's not even possible to control what gets put up on the net). In other words, the regulations will encompass the broadband providers - ISPs and mobile companies - and their services to end consumers. 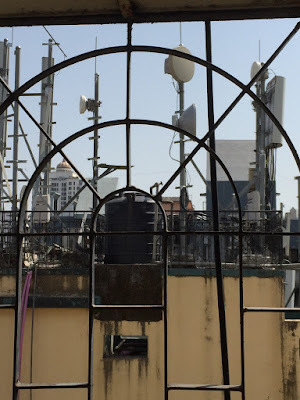 The inclusion of wireless and mobile networks is a big one - till now, FCC has regulated only wired internet. Mobile internet will increasingly become the future of internet access. 2) The proposal will codify four 'principles' of an earlier Internet Policy designed to protect consumer's access to content, services, and applications of their choice, and through devices and service providers of their choice. In short, it is an assurance that competition can exist in the broadband space to ensure that the needs and rights of consumers are protected. 3) The proposal will also codify two new, additional principles of broadband access which apply to broadband providers. Firstly, that they will be required to not discriminate between services, content and applications that are offered to consumers through their own platform. This assumes significance when we consider that today many broadband providers offer both free and paid services and content like video and voice, which could clash with the free or paid products and services offered by other companies. Secondly, the broadband companies would be required to have greater transparency in disclosing information about how they manage their networks and users. As congestion on networks increases, broadband providers have developed sophisticated means of shaping and controlling internet traffic. For instance, some providers block torrents, conduct 'deep packet analysis' to understand the nature of traffic on their networks, and implement 'fair usage' policies that favor greater speed to low-usage end customers compared to those with extremely heavy upload and download. The FCC proposal will not end such practices by broadband companies, but will force them to make clearer disclosures upfront. 4) Finally, the FCC proposal recognises the right of broadband providers to undertaking 'reasonable network management'. To quote, " The draft rules would not prohibit broadband Internet access service providers from taking reasonable action to prevent the transfer of unlawful content, such as the unlawful distribution of copyrighted works." Till now, the proposed regulations were protecting consumer rights - in this clause, the emphasis is on protecting the rights of corporate entities. 5) The FCC has created a separate category for 'specialised' or managed services of the ISPs and is drafting proposals to regulate such services. What are the implications of the FCC's draft regulations and why are they attracting widespread commentary and criticism within the US? This Ars Technica review of 4 books on the subject of the free internet puts the entire issue into perspective. Broadband access itself is a potential 'bottleneck'. The internet may have every type of content on it, but who controls the access point? It is the network operators. It is particularly revealing that the operators have been using the US First Amendment (Freedom of speech) to argue against net neutrality and claim that they can control traffic on 'their' networks. So does the right to freedom protect consumers, the corporations, or both, and how will it do that? Their does not seem to be an easy answer to this question. Unless we are able to restrict network providers to a role only as providers of a 'pipe' (common carriers, in other words) as opposed to cable networks which are closed carriers controlling and producing their own content. 2) Does the net need regulation at all? It is an undisputed fact that the open internet has been a communication rennaisance, giving a voice to millions of people, and that a neutral net has been a breeding ground of innovation and competition. However, are we fine as we are? A dominant line of thought is that the net has been proven to govern itself - and what we need to protect, if at all, is it's naturally open structure. Is government intervention needed at all? Will it make things better or worse? And if there is government intervention, should it not be focussed on consumer rights rather than on the consumer-business interface? Do companies' rights and regulations really need government sanction or can we leave market forces to decide? Past history has shown that legislation can force companies into oligarchic structures that protect an industry's profitability, more than consumer interest. 3) Does it benefit the consumer, or are some parties only protecting their own interests? The FCC lost some ground earlier this year in the net neutrality debate when a US court ruled against their authority under current law to impose regulations on ISPs. Clearly, the proposed legislations put FCC back in the forefront of regulation. And by extending the purview to mobile broadband networks, FCC is sharpening its teeth as well. You can read the Wall Street Journal article by Robert M. McDowell, Republican commissioner of FCC, to get a perspective on this. For another perspective, read the revised net neutrality proposal submitted to FCC by Google and Verizon earlier this year. Interesting to note that they proposed to entirely exclude mobile broadband services from the scope of the proposal. Does that come from a vested interest of both Google and Verizon in Android-powered devices? Kindle : the cheapest and best ebook reader?